A foundation wall provides support for the entire structure you are building. Foundation walls should be planned and constructed carefully as they are probably the most important part of the structure. When foundation walls are not built correctly, cracks might appear and ​a settling of the structure can also occur. Cracks may occur due to the foundation being ​backfilled before the concrete has achieved the required strength or because the necessary amount of steel was not placed accordingly. A foundation wall should be built in such way that the top of the footing shall be no higher than the depth of erosion and scour. If you cannot achieve this, you must consider using a pile foundation that can be installed at higher depths. A poorly embedded wall will lead a building to simply slide along the ground surface. 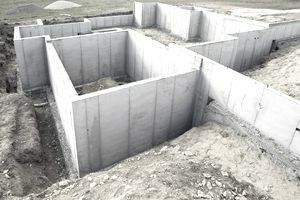 Foundation walls will typically require lateral support from the floor system and diaphragm, and connections to the top of the walls must be detailed properly. Foundation walls should be constructed high enough, so the bottom of the floor is above the design flood elevation. It is recommended to have at least 8 inches above the DFE at all points. When you are building a masonry or concrete foundation wall, it shall have a minimum thickness of 6 inches. For larger foundation wall depths, the minimum thickness must be the greater of 6 inches or 1.5 times the length of the footing projection from the foundation wall. Foundation walls can be built from almost any material, but concrete, masonry, and wood are predominant. If wood is selected, you will need to be sure that it has been treated or certified for marine use, and even cuts and holes should be field-treated. Masonry foundation walls should be fully grouted and reinforced, while concrete foundation walls must be reinforced and the concrete mix must be a high-strength, low water-to-cement ratio. Wall openings are really important when it comes to balancing the water levels inside and outside the walls. Building codes require air ventilation openings that normally do not satisfy the floor opening requirement. Air openings shall be designed near the top of the wall, while flood openings shall be close to the bottom of the wall. One single opening probably will not be enough to act as both air and flood opening, so be sure to have the right dimensions for each one of them. When building your walls, avoid using excavated soil to promote drainage away from the structure, by raising the exterior grade. By doing so, water will eventually generate additional loads against the foundation wall. Make sure the interior grade is at or above the lowest exterior grade next to the structure, as this might meet NFIP requirements. Flood openings in the foundation wall will allow floodwaters to exit the crawlspace once floodwaters recede. When Do You Need a Bored Pile? Home Builders: What You Need to Know About Low-E Windows?